Children are growing and developing with every passing day. Young children who experience trauma are at particular risk because their rapidly developing brains are vulnerable. Early childhood trauma can affect many functions including memory, attention, perceptual awareness, language, imagination, and the ability to regulate emotions. To learn more, visit Harvard University’s Center for the Developing Child. Through our Bright Space programme, we partner with specialist agencies in the UK and Ireland to create and support warm, safe, enriching environments for children of all ages to build caring relationships, heal from trauma through play, and experience happiness. 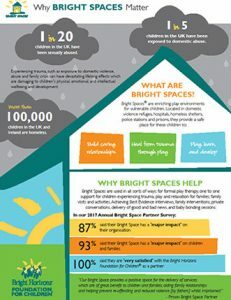 Our Bright Spaces are not only wonderful rooms for children to play, but they also create a place for children where they can connect with other children, their family, and supportive adults who can provide needed services. Having a place for families to relax together helps them to build important bonds that strengthen the family during their time of difficulty. In an atmosphere of safety and trust, children and adults are able to make better decisions, regulate their emotions, and provide important emotional support to each other.